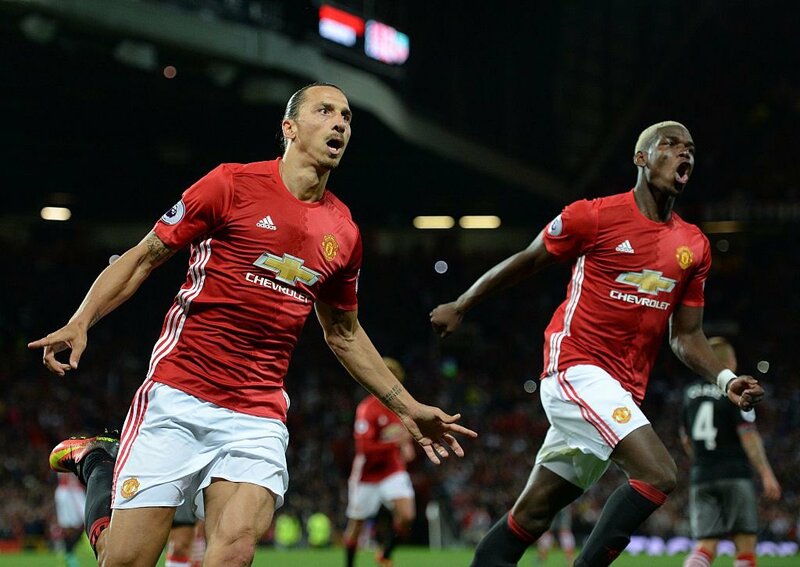 A goal either side of half time from Zlatan Ibrahimovic ensured Manchester United kept up their impressive start to life under Jose Mourinho. Much of the pre-match focus was on the returning Paul Pogba, and this time the Frenchman was donning the famous red jersey with the tag of "most expensive footballer" on his collar. 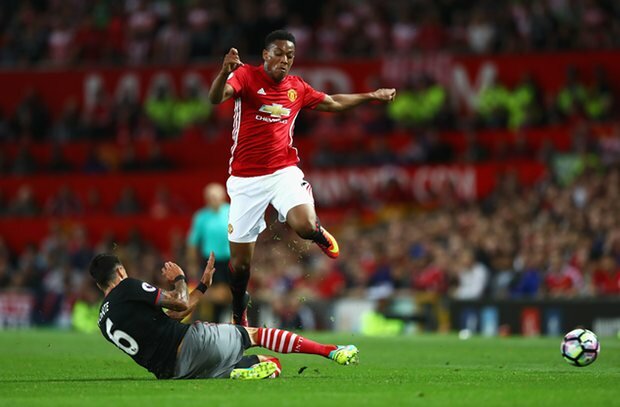 An expectant crowd at Old Trafford eagerly anticipated the return of the prodigal son, but it was clear from the opening exchanges that the Euro 2016 finalist was still feeling the rust from a shortened preseason and looked off the pace - his first three passes failed to reach a teammate. A bright, breezy start for the Saints saw United sitting back and allowing their guests time on the ball, reverting to the compact system Mourinho has become notorious for utilising when under the cosh. Marouane Fellaini did well to ward off any danger before the likes of Long and Redmond could get a touch within range, as a quiet game breathed to life after a quarter of an hour. A ball pumped forward to Ibrahimovic was set down nicely for Pogba, but the new man's shot wasn't going to unnerve Fraser Forster. Moments later, it was the visitors who flooded forward in search of breaking the deadlock. Nathan Redmond spun away neatly from Eric Bailly before narrowly overhitting a cross past the arriving Dusan Tadic, Puel's team were not here to roll over. The Saints continued to bomb forward and play with confidence, and soon carved open the best chance of the opening half hour. The vision and intelligence of Tadic showed as the Serb flicked the ball into space for Long, who bolted away from Bailly to confront De Gea and the goal. However, time caught up with the Irishman and his first time shot rolled feebly towards the grateful hands of De Gea. Wayne Rooney tested Forster's reach with a well hit drive from distance, but it would take more than that to beat the England international goalkeeper. Then it happened. A wonderful move from United this time caught Southampton napping as Antonio Valencia slipped a pass through for Rooney down the right flank. 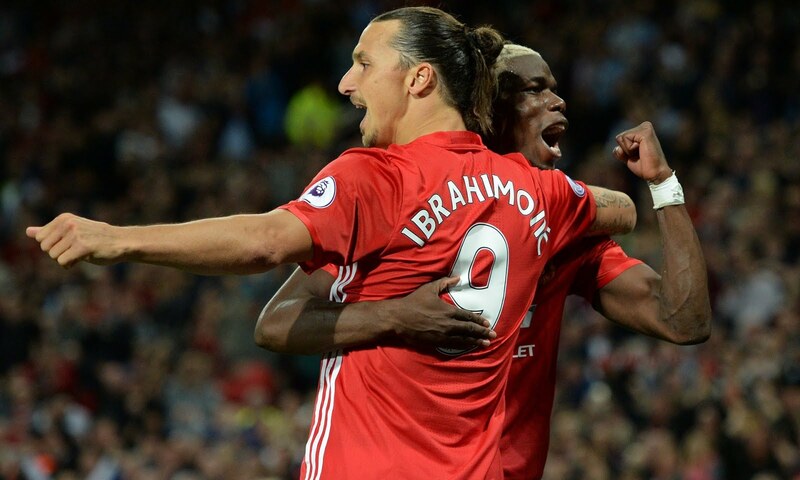 The United skipper then took his time to swing in a sumptuous cross which was met by a bullet header from Zlatan Ibrahimovic - the Swede's third goal in as many games for the Red Devils. It proved to be the last tasteful action of the first period. As they did in the first half, Southampton dominated the early parts of the second 45 minutes. Within five minutes, the travelling faithful thought they had seen their team equalise with a well worked, intricate move before Tadic had his goal chalked off for a foul on Bailly. The talisman appeared to have shoved the centre-back before glancing a header past the line. Things turned from bad to worse as former Saints' fan favourite Luke Shaw marauded forward and drew a foul from Jordy Clasie, penalty to Mourinho's men. Despite controlling 65% of the game, Southampton were 2-0 down and up against it inside the Theatre of Dreams, as Ibrahimovic undertook penalty duty to double the lead, his and his team's tally for the night. Southampton continued to give it their all, not settling for defeat as a result. Clasie attempted to make amends but his lashed shot flew well wide and Virgil van Dijk ventured forward before being cut out by Bailly. The performance of the headline act, Paul Pogba had been little to jump about thus far, though this could fairly be attributed to a lack of sharpness and match fitness. The Frenchman rose like a falcon to stab a header back at goal, but the ball refused to go in. The away side had run out of gas by now, and United were in cruise control, closing out the game with considerable ease as Henrikh Mkhitaryan made his home bow, the ex Borussia Dortmund wideman stretched the Saints' backline even further without imprinting a dent on the scoreline. Overall, a highly positive performance and result for Jose Mourinho's side has Red Devils fans satisfied with their start to the season as early pacesetters. Zlatan Ibrahimovic proved that he isn't just a washed up veteran on a retirement tour, but rather a bonafide star and still the real deal.